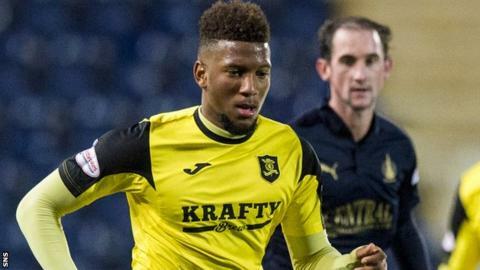 Falkirk have signed forward Myles Hippolyte from Livingston for an undisclosed fee and secured former Kayserispor keeper Deniz Dogan Mehmet. Championship rivals Livingston have themselves added defender Osman Kakay on loan after the 18-year-old signed a new contract with Queens Park Rangers. The 21-year-old Hippolyte had joined Livi after leaving Southall in 2014. Mehmet, 23, joined Turkish Super Lig club Kayserispor from West Ham United in 2011. He impressed in a development league game while on trial. Falkirk manager Peter Houston told his club website: "Deniz is a player who we have watched for some time and are pleased to get on board. "He comes to us with a decent pedigree and will provide further competition within the goalkeeping department." Hippolyte, who started his career with Brentford and had spells with Tamworth, Hayes & Yeading United and Burnham, has scored twice in 22 appearances for Livingston this season. "He is a player who can add something different to the squad," said Houston. "He has bags of pace and trickery and will hopefully be a player who will excite the fans. "He has impressed me on every occasion that I have seen him, so it is great to get the deal done." Livingston, meanwhile, revealed that David Hopkin had moved for Kakay on the recommendation of the manager's former Leeds United team-mate, Jimmy Floyd Hasselbaink, who is manager at QPR. The versatile defender can play on either side of the back line. Meanwhile, Falkirk terminated the contract of midfielder Alex Cooper so he could join Championship rivals St Mirren. The 24-year-old midfielder, signed from Ross County in 2014, had only made two appearances this season.